Andy Warhol is known worldwide as one of the leading figures of the 1960s pop art movement, encompassing a wide variety of mediums like painting, printmaking, sculpture, film, music, and more. Now, one more medium has been discovered after 30 years in hiding: digital art! Media artist Cory Arcangel and the Andy Warhol Museum have recovered digital works created by Warhol from the 1980s from a series of old floppy discs stores in the museum’s archives, and are an interesting look into the famous artists’ exploration of the previously fresh technology. 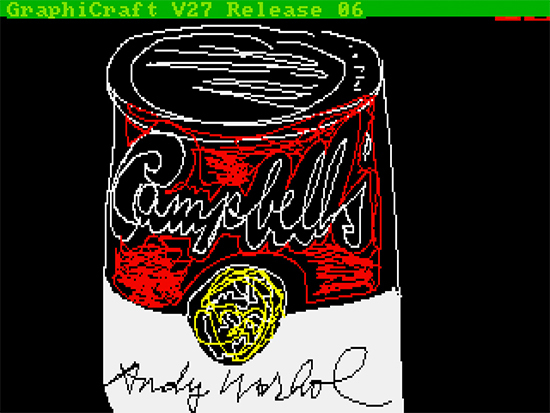 The art, created on a Commodore Amiga home computer, contains a variety of sketches and photo experiments, including a self-portrait, a digital recreation of his Campbell’s soup can, a photo edit of Botticelli’s “The Birth of Venus”, and more! The new artwork is now part of an upcoming exhibit titled “The Invisible Photograph” at the Carnegie Museum of Art in Pittsburgh, Pennsylvania, so Warhol enthusiasts should definitely give this exhibit a look! Andy Warhol, born in Pittsburgh in 1928, was an artist and filmmaker who is considered a founder and a major figure of the pop art movement. Warhol graduated from the Carnegie Institute of Technology before moving to New York, where he began his career as an illustrator. Warhol’s career took off in August 1949, when Glamour Magazine asked Warhol to illustrate an article called “Success is a Job in New York”. Ever since, his popularity skyrocketed, and by 1955, Warhol had become a household name. Well-known for creating ink images with slight color changes, Warhol often painted popular items like Coca-Cola bottles and celebrities faces, like Marilyn Monroe. He expanding into film in the 1960s, and made a series of films about time, boredom and repetition, which are now underground classics. Warhol continues to be known as a pioneer of pop art, and one of the most recognizable artists in history.